Shanxi Province is among the northern Province traditionally counted as central parts of the Han Chinese territory and cultural sphere. Although in history, the entire north of China including the location Beijing were lost at several times to encroaching neighboring peoples and their rising Empires (the Khitans, Jurchen, Mongolians, Manchu), and therefor other population groups did live in the Province up to as late as few decades ago, for well over 150 years already, their existence and livelyhoods have been pushed to the background by the ever expanding farmlands and sedentary lifestyles of the Han people. In addition, the repression of ethnic cultures during much of the history of the Peoples Republic since 1949 AD but especially during the Cultural Revolution Era (1966 - 1976) gave destroyed much of what was left of the specific local and rural cultures of the Province. Since the death of Mao Zedong in 1976, and the subsequent turn back to Capitalism and some forms of tolerance, the ethnic cultures, breathing a short sigh of reprieve, have been faced with the rapid changes brought by modernity, which included heavy pollution from arising industries, severe air pollution, and not least - the infringements on ancestral farmlands.Today, the Province claimed to be rich in various ethnic groups is a land thoroughly dominated by Han Cultures. That said, historically minority groups did settle and live in Shanxi Province and even if some of the rural cultures of today are of Han origin, with the rapid advance of modernity in mind, this does not mean that they are less interesting fun, or valid as an experience. It should be noted that remote rural villages do try and retain their ancient heritage and cultures, selecting to take the to the tourist market by trying to turn themselves into experiences of rural living and ethnic culture at the same time. Some villages and towns, especially when they are situated relatively near the ruinous path of the Great Wall of China which tracks through the Province, are said to be having quite some success in carving themselves a niche and earning a modern day living in the tourism industry. There is no information available on Transportation in Shanxi Province. As the study ”Villages where China's Ethnic Minorities Live” by Bjorn Gustafsson and Ding Sai (published in November 2006, by IZA DP No. 2418 Forschungsinstitut zur Zukunft der Arbeit Institute for the Study of Labor) shows, in the 38 rural villages surveyed in Shanxi Province in the process of the 2002 population census no ethnic minority members were recorded and in all 38 villages, the Han (a.k.a. 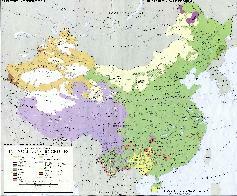 the Chinese) formed the majority group in all locations and were the only inhabitants found. According to the Chinese Government information website China.Org.Cn of the 56 recognized ethnic minority groups in the Peoples Republic of China today, the Province of Shanxi officially counts no less than 34 such groups. Among them, the Nationally pre-dominant group of the Han are the largest in number among the population of the Province. As one may make up from the various historic maps of China available as part of www.ChinaReport.com one can understand that Shanxi Province has since long been thorougly part of Chinese Civilization. 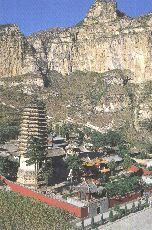 In fact, the Province is counted as part of the earliest places of settlement of the mix of people that now make up the Han ethnic group and is famous for its archeological finds proving its place as the cradle of Chinese Civilization along with the great Yellow River that flows along its outer borders determining mouch of them. As one will discover after arrival in the Province, the majority of people venturing about on streets, except for the clearly distinct Hui who identify themselves by wearing a particular style of Hat, seem to be average joe's belonging to Han group. The local dialects are versions of the northern mandarin branch of the Chinese language. Therefor, ethnic languages are rarely spoken, and the other ethnic groups one encounters are usually the Hui. The Hui, who make up only a pitiful 0.2% of the population are practically the only identifyable ethnic minority group in the Province entire. As most tourist will come to find, apart for being avid traders the Hui are also great chefs who prepare kebabs and other much loved Islamic type foods, and therefor may be more likely to come into contact with foreign travelers. As the Hui have their own Mosques in cities as well as the province, they may be found there as well. At the time of the last population Cencus Shanxi Province numbered near 36 million (35,712,111) citizens, of which the Han, accounted for 99.75 percent of the total population. Therefor, although the National Government claims a rich diversity of minorities among the population, in reality they do not really exists. Of the total provincial citizenry, only some 67,000 people are registered as belonging to a minority group. The 34 groups that are officially listed under include the Hui, Manchu, Mongolian, and even Korean (Chaoxian) and Tibetan(s) however they are generally spread among the population. To find the minorities in Shanxi Province, one has to take to road thoroughly informed. Regardless of statistical realities, the National Government no less the existence of a large number of "ethnic cultural villages" within Shanxi Province. In Total there are 58 villages in Shanxi Province where ethnic minority groups are supposed to live in compact communities. However, not even online Government sources, let alone the average travel agency will be able to name and list them. Only few can point the way to their exact locations and provide proper road directions. Below is an attempt at listing the main sites of ethnic culture and associated tourism and scenery within Shanxi Province. WUTAI SHAN BUDDHIST HOLY MOUNTAIN. Situated near Hunyuan County Town, Datong Prefecture in the north east. Due south east of Taiyuan City. The rural counties encircling both cities are renowned for their many rich land owning estates which have survived from the golden ages of Shanxi Province of the past.